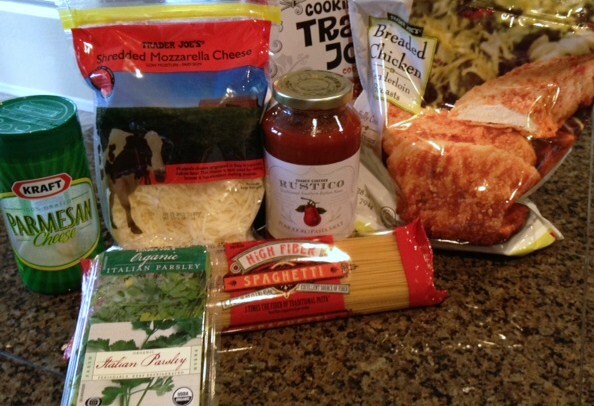 You are here: Home / Rachel Recommends / Terrific Trader Joe’s Cookbook Find! Terrific Trader Joe’s Cookbook Find! Manic: While my daughter had her teeth cleaned, I ran across the street to Trader Joe’s to pick up something for dinner. Managed: Running into my great gal pal, Liz who told me that Trader Joe’s has a cookbook, that was available at a gift boutique right next door to Trader Joe’s. She told me that the recipes have ingredients that are all sold at Trader Joe’s. I love this idea, so I popped into the gift shop and bought myself a copy. 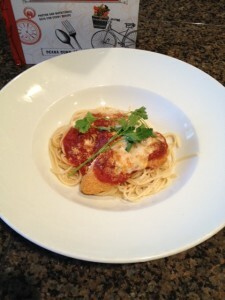 Read on to see more about the cookbook and what entree I prepared that night from my new book of recipes! 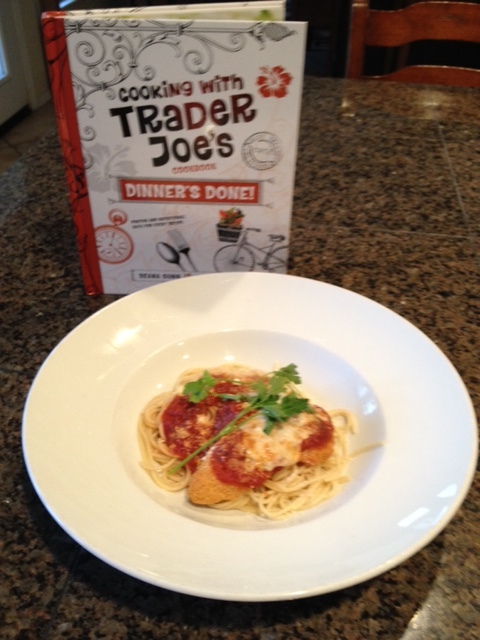 The cook book is called Cooking With Trader Joe’s Cookbook: Dinner’s Done! by Deana Gunn and Wona Miniati. I bought my copy at a cool gift shop called Expressions Boutique located at 40th Street and Chandler Blvd. in Ahwatukee, right next door to Trader Joes. My copy cost me $24.95 and it is a nice hardcover book filled with recipes that include a picture of each dish. I love cookbooks with photos! The store also sold several other versions of Trader Joe’s cookbooks, including lower calorie meals, a smaller book called The Companion and others. I chose this one because I’m always looking for dinner ideas for my family. 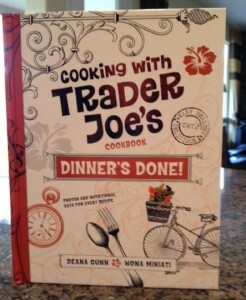 Copies of the book can also be purchased at the Cooking with Trader Joe’s website. Since I don’t have permission from the authors to share a recipe, I can’t do that, but I can show you what I prepared from the book. For my first trial recipe, I selected a dish called Easy Chicken Parmigiana and I can tell you that my family loved this entree! And I loved that I could easily pick up the ingredients at my local Trader Joe’s. 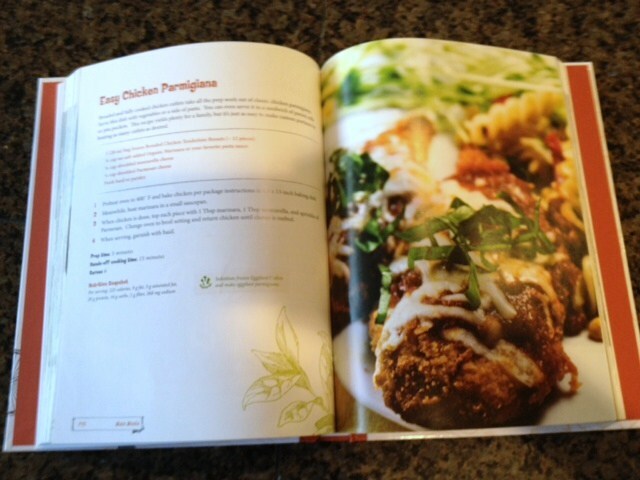 The book looks nice and the recipes are super quick and easy to follow…a real plus for a manic mom! And I love how the finished dish looks and tastes! Have you tried a Trader Joe’s cookbook recipe? Tell us your favorite here in the comments section! With all your subscribers, listeners and readers, I would love to see you put a Managed Mom Cookbook together. Have a section where your readers send in their favorite recipes, easy on the run dishes, generation to generation recipes. It would be a great Cook Book and a Wonderful gift for anyone. Money could go towards a charity of your choice. You could include extra pages with equivalents, pages with helpful household tips etc. Just a thought, I bet your readers would have some great recipes! I love this idea, Bridget! At some point, when I can get a little more time on my hands, I want to do this! Love it! Thanks for the terrific idea! !